A complete color wheel exercise. When I’m laying a wash, I want to focus my attention on creating color mingles, wet-in-wet effects and edges that are just the right degree of softness. So many things that will only happen if the timing is just right! I want design and drawing and color all worked out ahead of time, so I don’t miss the magic, fleeting moment when my desired effect can be coaxed into appearing. When I started painting in watercolor, I used just 3 colors—quinacridone rose, cobalt blue and azo yellow. I learned them inside out and sideways, so I never had to think about color-mixing. Now, in my beginner classes, I’ve added burnt sienna and ultramarine blue to make mixing darks and neutrals faster and more convenient, but I still have students begin with those three primaries and learn them thoroughly. The main exercise we use to learn about mixing color is a color wheel. Over time, I’ve modified the usual color wheel format to allow us to work wet-in-wet within each section, letting the water blend the paint, without having to wait forever for each section to dry before proceeding to the next. I also use this exercise myself when I add a new color to my palette, or to explore possible palettes of 3-5 colors for a particular project. (I am just as susceptible to a yummy new color as any artist, but I almost never use more than 5 colors in any given painting (typically, only 3). 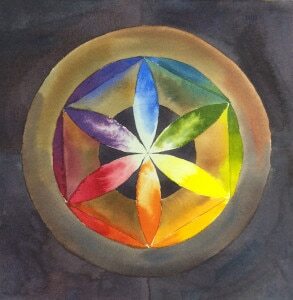 You can use this exercise with a primary triad that you hope will allow you to mix a wide range of pure colors (e.g. hansa yellow, quinacridone rose and phthalo blue), or a “sort-of” primary triad that will automatically give you lovely neutralized colors on part or all of the color wheel (e.g. raw sienna, naphthol red and ultramarine blue), a triad including one or more secondary colors (e.g. cobalt turquoise, cadmium orange and gamboge). You can also use more than three colors, if you like. I am not using this exercise to teach color theory in the abstract. I use it to explore not just what colors I can mix, but how the pigments interact with one another. As an added bonus, the wet-in-wet technique produces a lovely “stained-glass” effect, so these studies are lovely little paintings in their own right.